10 perros han conseguido un hogar definitivo este mes. 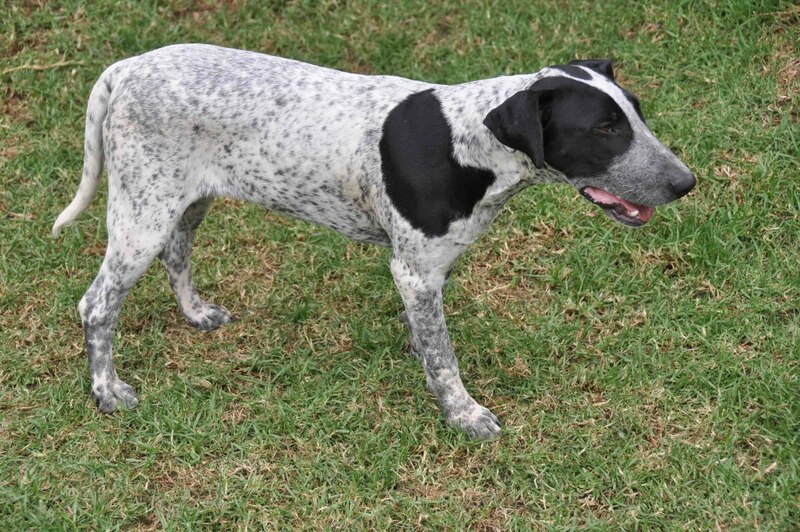 10 dogs have find a new definitive home this month. 10 Hunde fanden diesen Monat definitiv ein neues Zuhause. TIGRE, lo rescatamos y salvamos de una persona que lo maltrataba. Despues de una corta estancia en nuestro albergue viajó a Alemania el dia 2 de Julio. TIGRE, we rescued and saved him from a person who was mistreating him. 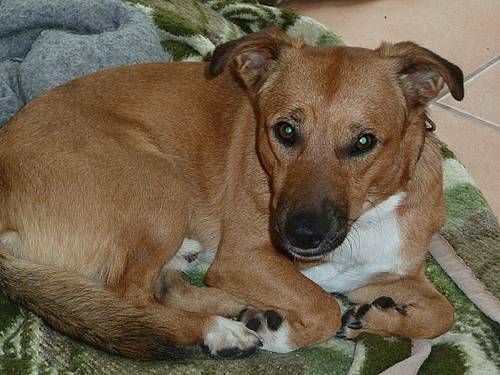 After being only a short time with us at the shelter he travelled to Germany on the 2th of July. TIGRE wurde bewahrt und gerettet vor einer Person, die ihn misshandelte. Nachdem er nur kurzbei uns war, reiste er am 2.Juli nach Deutschland. . .
PINTI, rescatada de la perrera de Santa Brigida, donde llevaba mas de un año encerrada. 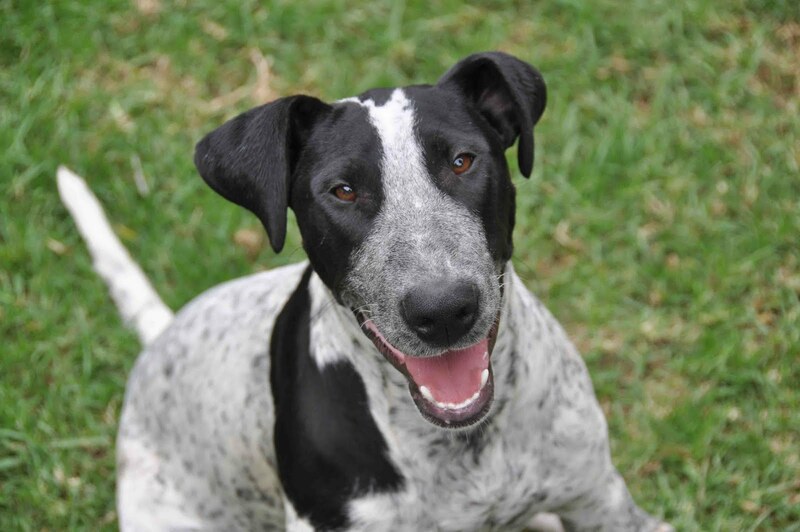 PINTI, rescued from the dog-pound of Santa Brigida, were she was over one year closed in. PINTI, aus dem Tierheim Santa Brigida gerettet, wo sie über 1 Jahr eingesperrt war. Tambien paso una corta estancia con nosotros, donde le dimos muchos mimos. She also was only a short time with us, where we gave her a lot of pampering. Sie war ebenfalls nur kurz bei uns, wo wir sie sehr verwöhnten. El dia 2 de Julio tambien viajó a Alemania. On the 2th of July she also left to Germany. Am 2.Juli flog sie ebenfalls nach Deutschland. POLI, tambien rescatada de la perrera de Santa Brigida, donde llevaba 7 meses. POLI, as well rescued from the dog-pound of Santa Brigida, where she was for 7 months. POLI, auch dem Tierheim Santa Brigida gerettet, wo sie über 7 Monate war. A los dos dias de estar en nuestro albergue, por buena y por simpatica consiguó ser adoptada aquí en la isla. After being only 2 days at the shelter, she already got adopted here on the island because of being so good and of her sympathy. Nach nur 2 Tagen in unserem Heim wurde sie bereits hier auf der Insel adoptiert, weil sie so lieb und sympathisch ist. NICK, este lindo cachorrito lo estuvimos cuidando en una casa de acogida, y al poco tiempo tambien consiguó ser adoptado en la isla. NICK, this beautiful puppy was taking care of in a foster home, and only after a short time he also got adopted here on the island. NICK, ein hübscher Welpe, wurde in einer Pflegestelle betreut. Bereits nach kurzer Zeit wurde er hier auf der Insel adoptiert. DADA, nuestra querida bulldog frances, mayor y enferma. Tambien rescatada de la perrera de Santa Brigida en muy malas condiciones de salud. DADA, our lovely French Bulldog, old and ill. As well rescued from the dog-pound in Santa Brigida in very bad healthy conditions. DADA, unsere liebenswerte Französische Bulldogge, alt und krank. Sie wurde schwerkrank ebenfalls aus dem Tierheim Santa Brigida gerettet. Estuvo en una casa de acogida, donde se repuso dentro de lo posible, engordó y se llenó de mimos..
Sie war in einer Pflegestelle, wo sie sich erholte so gut es ging, zunahm und mit Streicheleinheiten verwöhnt wurde. Pero por motivos de salud del voluntario que la estaba cuidando, tuvimos que buscar otra casa de acogida. Se fué temporalmente con unas personas que ya tienen otro perro de ANAHI adoptado. Al cabo de una semana nos lllamaron para decirnos que ya no se pueden separar de ella, y que la querian adoptar para siempre. Pues así ha sido, y DADÁ tiene una familia definitiva que la cuidará muy bien en su vejez. 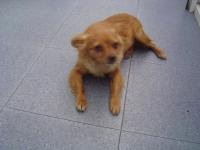 But because of healthy reasons from the volunteer who was taking care of her, we had to search for another foster home. 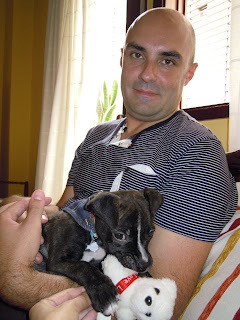 Temporally she went to some people who already had another dog adopted from ANAHI. After one week they called us to tell us they can not be separated any more from her and they want to adopt her forever. So like this it happened and DADÁ finally has a definitive home where they will take care of her in her old age. Nach einer Woche riefen sie uns an, um uns mitzuteilen, dass sie sie nicht mehr hergeben und sie für immer adoptieren wollen. 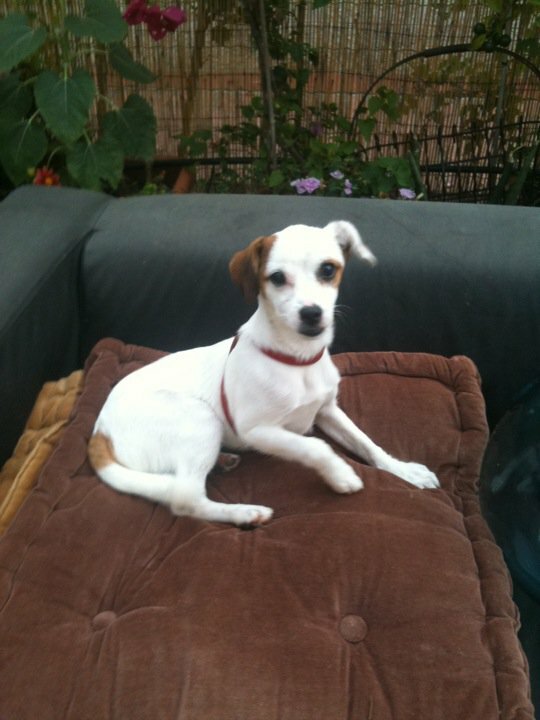 So geschah es und DADA hat letztendlich ihr endgültiges Zuhause gefunden, wo man sich liebevoll um das alte Mädchen kümmern wird..
Es un perro noble, joven y activo. Llevaba casi un año con nosotros, pero al fin ha conseguido una familia. He is a noble, young and active dog. He was almost one year with us, but finally he find a family. Er ist ein nobler, junger und aktiver Hund. Er war fast ein Jahr bei uns, fand jedoch letztendlich eine Familie. Viajó a Alemania para reunirse con sus propietarios el dia 6 de Julio. 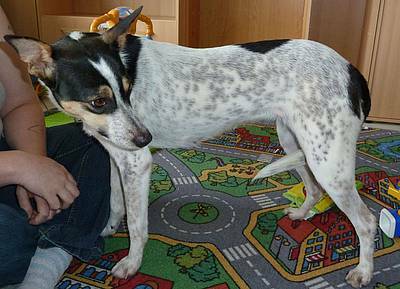 He travelled to Germany on the 6th of July to be reunited with his new owners. Er flog am 6.Juli nach Deutschland, wo er zu seinen neuen Besitzern kam. LINDA PALOMA, la dulce podenca. Fué adoptada hace dos años aquí en la isla, pero su propietario sufrió una operación y ya no la pudo mantener mas. LINDA PALOMA, the sweet podenca. She got adopted 2 years ago here on the island, but her owner had an operation and could not longer take care of her any more. LINDA-PALOMA, die süße Podencohündin. Sie wurde vor 2 Jahren hier auf der Insel adoptiert, aber ihr Besitzer konnte sich nach seiner OP nicht mehr um sie kümmern. Estuvo algun tiempo en el albergue de nuevo, hasta su nueva adopción en Holanda. For a while she stayed with us at the shelter again, until she got adopted again in Holland. Sie blieb eine Weile bei uns, bis sie nach Holland adoptiert wurde. Viajó el dia 29 de Julio. She travelled on the 29th of July. BAMBU, el pitbull de dos meses abandonado en un veterinario. Una voluntaria de ANAHI se lo llevó a su casa de acogida, pero a las dos semanas decidió quedarselo para siempre. BAMBU, the puppy pitbull from 2 months old, abandoned in a veterinarian clinic. 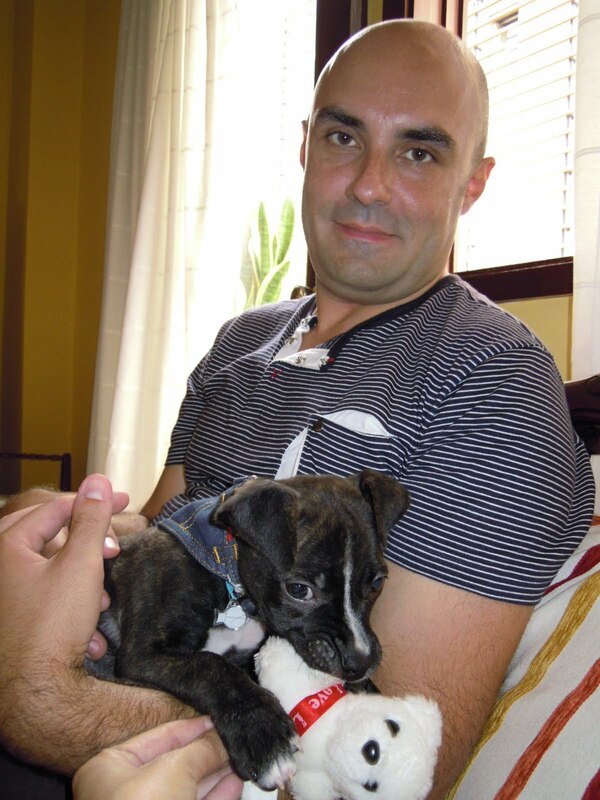 A volunteer from ANAHI took him home to foster, but after 2 weeks they decided to keep him forever. BAMBU, der bei einem Veterinär zurückgelassene, 2 Monate alte Pitbullwelpe. Ein Freiwilliger ANAHIs nahm ihn bei sich in Pflege, entschied sich aber nach 2 Wochen ihn für immer zu behalten. CANDELA, la pequeña chiguaga maltratada, consiguió ser adoptada en la isla. 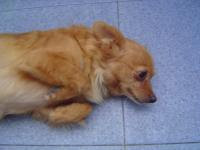 CANDELA, the small mistreated chihuahua, got adopted here on the island. CANDELA, die kleine misshandelte Chihuahuahündin, wurde hier auf der Insel adoptiert. 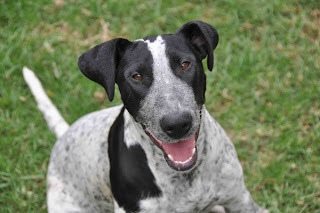 LINDA, esta preciosa perra de 6 meses que estaba en adopciones particulares, tambien consiguó una familia, y ademas con tres niños, por lo que la diversión está asegurada. LINDA, this beautiful 6 months old puppy was in our private section, also found a new family with 3 kids, so fun is guaranteed. LINDA, die hübsche 6 Monate alte Hündin, wurde über unseren Privathunde-Bereich von einer Familie mit 3 Kindern adoptiert, sodass es garantiert nicht langweilig wird. Tambien ha habido un final felliz para PATY y MECHON, estos dos gatitos con un futuro incierto porque su dueña tenia que trasladarse y no podia llevarselos. Finalmente consiguió un lugar donde puede vivir con ellos, y ya no se tienen que separar. 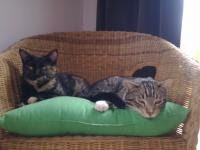 Also there was a happy ending for PATY and MECHON, these 2 kittens had an insecure future because there owner had to move and couldn`t take them with her. At the end the owner found a home where she could live with them and they don`t have to be separated. Auch für die beiden Kätzchen PATY und MECHON gab es ein Happy End. Sie hatten eine ungewisse Zukunft, weil ihre Besitzerin umziehen musste und sie nicht mitnehmen konnte. Letztendlich fand ihre Besitzerin eine Wohnung, in der sie weiterhin mit ihnen leben konnte, sodass sie sich nicht trennen mussten.